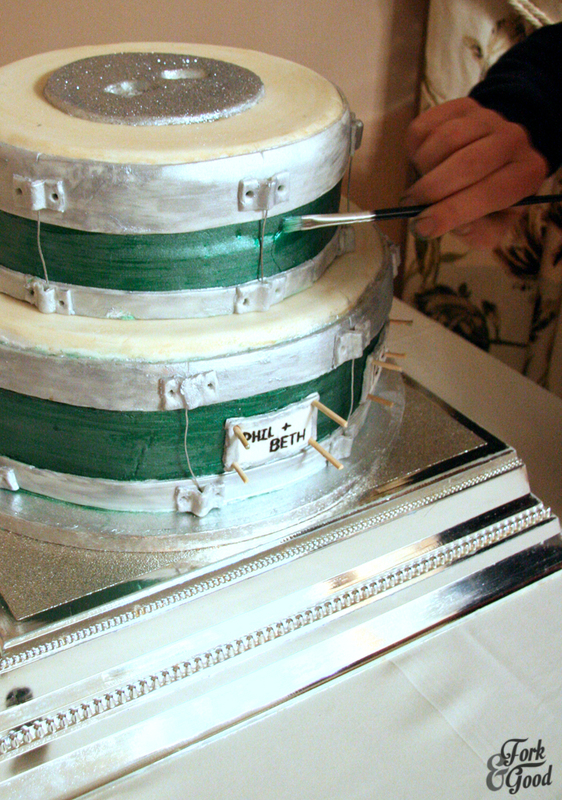 My Best Friends' Wedding (cake) - Fork and Good. 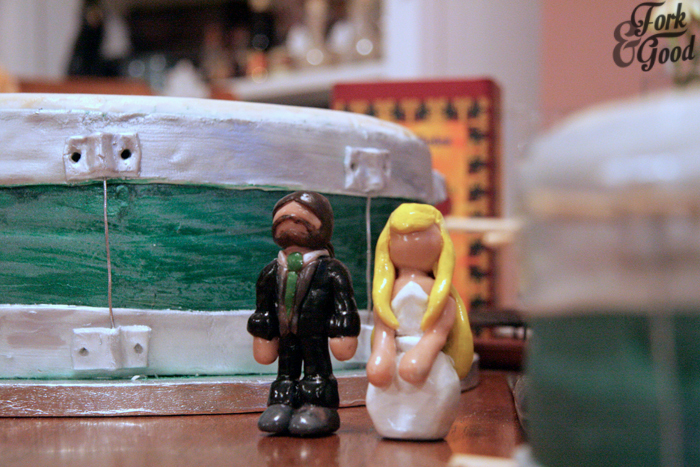 This is my nervous, wine fuelled account of how we made two of my best friends' wedding cake. This is not a story involving Julia Roberts or Rupert Everett, as cool as that would be. Okay stay with me, there's a lot of pictures. We had just moved into our new house and we were unpacking a box of kitchen stuff (what else?) when my phone loudly beeped from the other side of the room. My awesome friend Phil, after months of mishaps that wouldn't be out of place in a wacky romantic comedy, had finally been able to pop the question to his lovely girlfriend Beth. I'd been waiting for this text for months! Within a week, we had a date to put in our diaries. September 14th 2013. Within another week, they were talking about the cake. They wanted a drum (they are both in a band, and Phil is a the drummer) and they wanted it green. They wanted me and another friend of ours to make it. Cue a whole year of panic. Like seriously, absolute panic. I had no faith at all that I could pull it off. Beths' laid back attitude of "As long as people come in and say 'Ooh look a drum!' I don't mind if it's not perfect." made me feel a little better, but I was still really worried about it. Now I was utterly bricking it. Which if you're not familiar with the term, I suggest you google it now. Go on, I'll wait. We up to speed? Awesome. Glad you've now got a nice mental image. 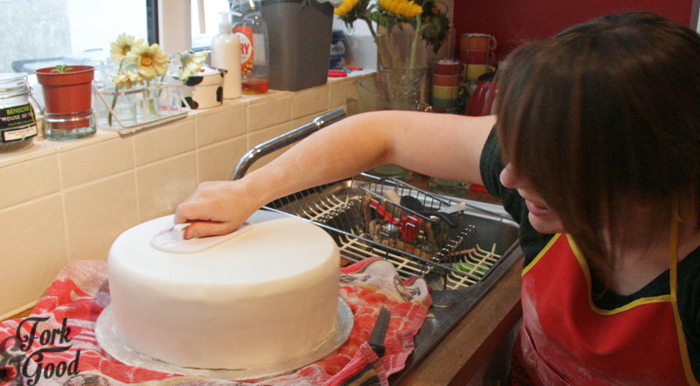 I spent the next 5 months religiously learning how to actually bake massive cakes, watching many cake programmes (oh the hardships) and making quite a few tester cakes before I started feeling a little bit less panicked. I spent my evenings practising how to do bits with Royal icing, I researched the best ways to get it the colour they wanted, I spent hours thinking "How on earth can I give them a cake they'll love?" And then before you know it, it's September 11th 2013. 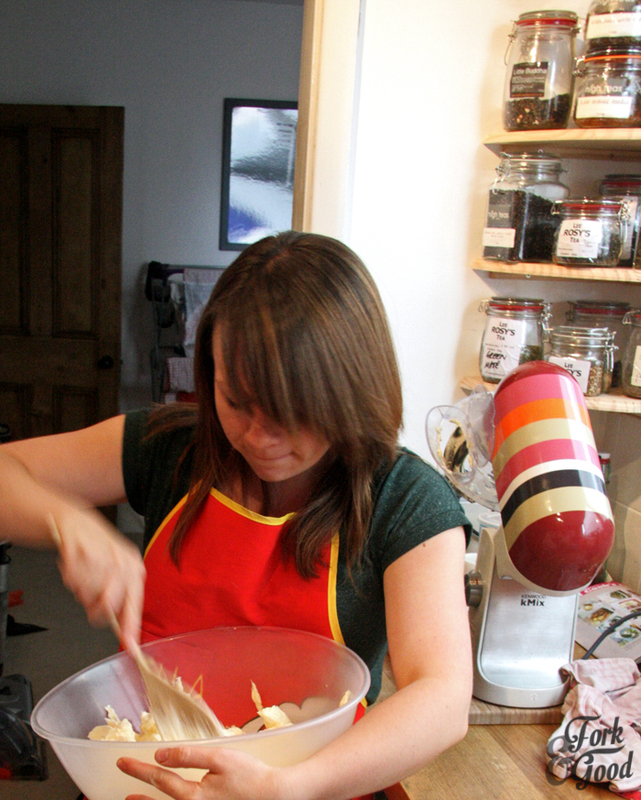 I know it's a bad day for many, but for me it's Kris' Birthday and this year it was nervous excited cake prep. I made him a birthday cake as usual (a pre-wedding cake warm up if you will), cracked my knuckles and prepared for the gruelling two days I took off work to make the cake for two of my best buds. And here it is... well the account... not the cake! I managed to rope my awesome buddy Georgie into helping me, as there was no way in hell I could bake and decorate a 2 tier wedding cake by myself with no experience. So at 10 'o clock on the 12th September, we cracked on. Get it? Pictures of eggs? Cracked on? Oh shut up, I'm hilarious. We had to add each egg one by one, and there were 10 eggs in one cake alone. My mixer got a bit of a seeing too that day I can tell you. We were using it from 10 in the morning right up until about 6 in the evening. 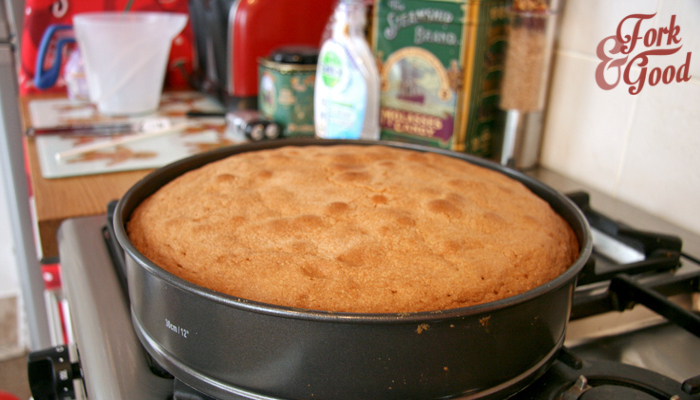 We could only cook one layer at a time, as the tin for the bottom cake was so massive and as any experienced baker will tell you, it's best to bake that batter pretty sharpish after you make it. Plus, two lots of batter wouldn't fit in my mixer. 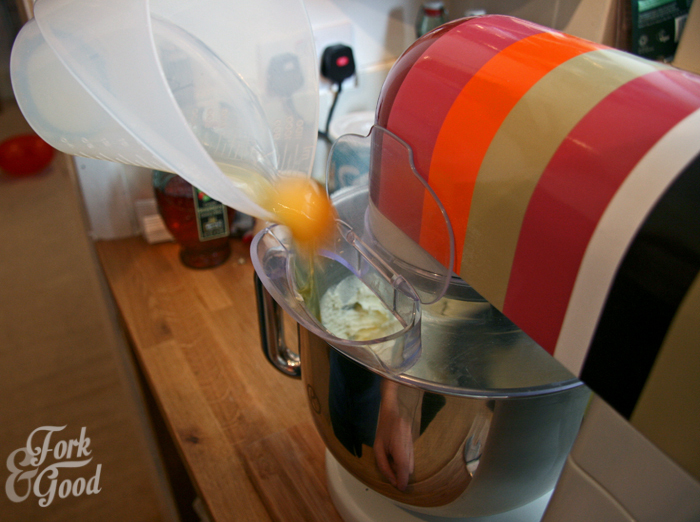 See that bottle sneakily standing in the middle of me and my mixer? That is some AWESOME Cornish strawberry wine. Essential for wedding cake making nerves. I'm going a little off track... but man, that wine was good! The wine bottle is looking a little emptier now huh? 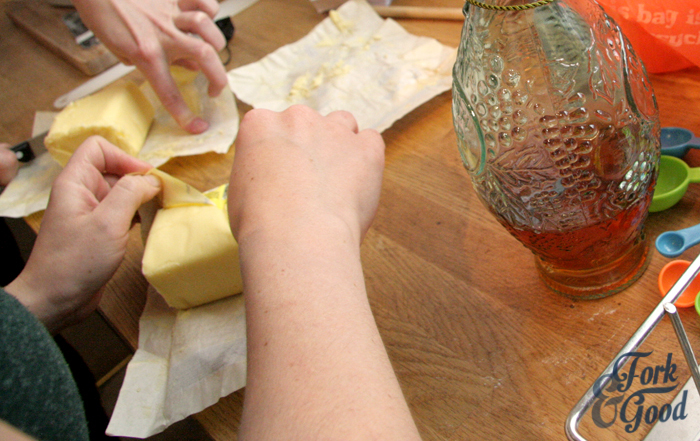 Just two buds, chopping up enough butter to give someone a heart attack. 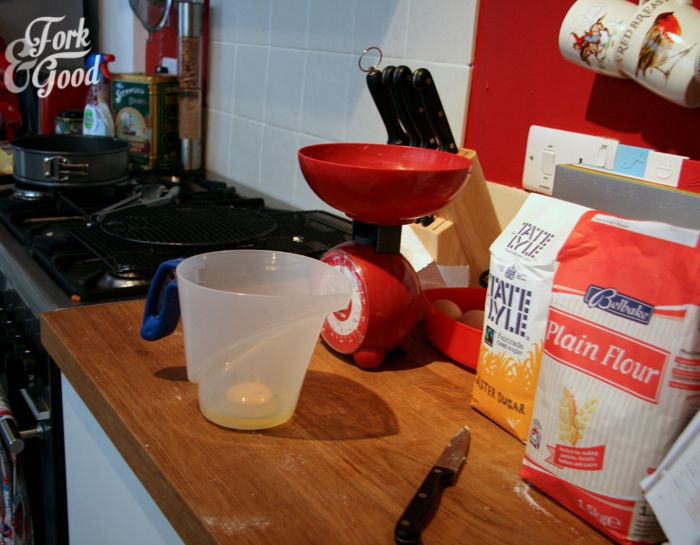 The recipe calls for the mixed egg, butter and sugar mixture to have the flour hand folded in by hand. Luckily, I had a bowl big enough for that task. It took about 20 minutes to fold that bad boy in. Cue sore arms. You ever tried to level a cake that big and thick? 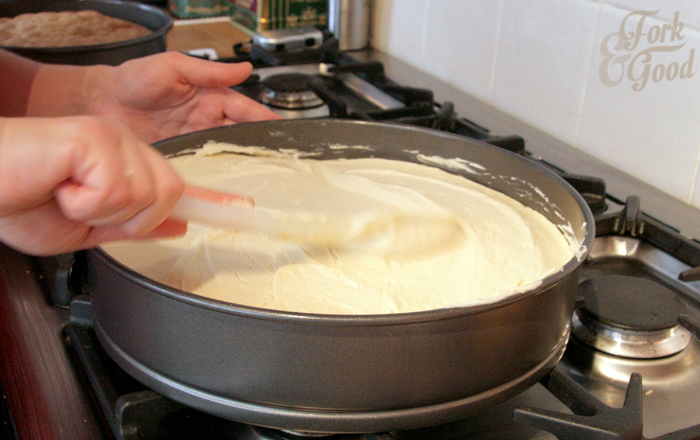 Madeira cake batter is no laughing matter! First 12" layer comes out of the oven after a MASSIVE 2 hr 35 minutes baking time. Luckily, it came out okay. We let it cool for the recommended 5 minutes in the tin, and then go about nervously releasing it onto the wire rack. On which it doesn't fit. 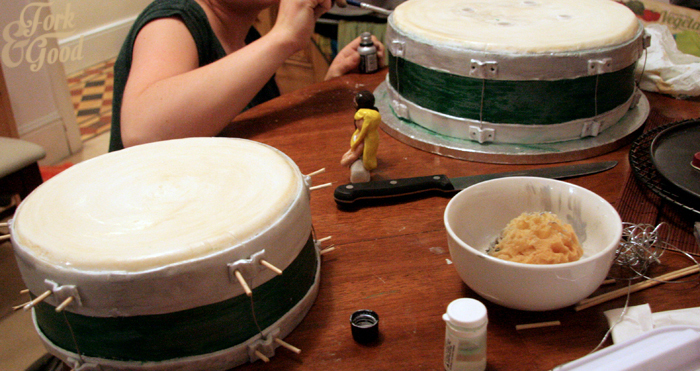 Like seriously, how many times in your life are you going to bake two 12" cakes that require cooling at the same time? 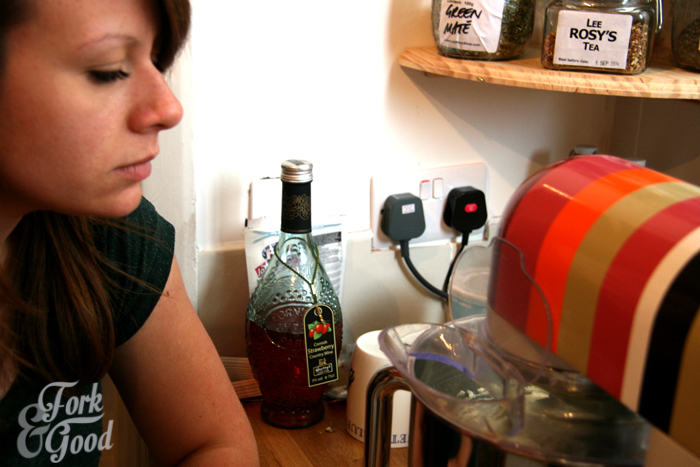 Not even me, with my fabulously stocked kitchen (I have like 5 different types of cheese grater for goodness cake!) was prepared for that. We found the biggest wire rack I had and laid my bamboo placemats over the top. Phew. 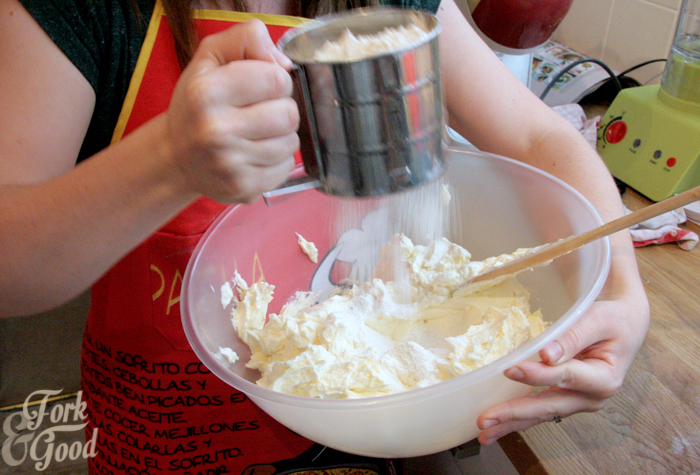 So a few more hours of this, baking and mixing malarkey, we were done. A few hours later after catching up on the Great British Bake Off (cause I'd obviously not had enough baking in the day), I nervously levelled off the cakes and left them to do the whole "sturdy up" thing overnight. The next day we got to work on the filling. That is a lot of jam. That's all there is to say about jam really. 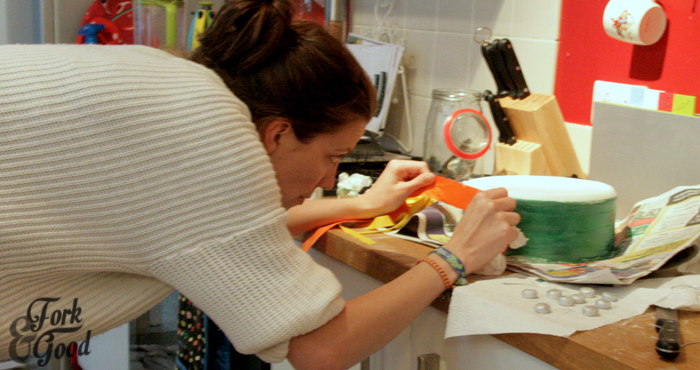 No picture of the process of actually putting the layers together, that required two sturdy hands! I'm happy to report that they were sturdy enough to not break or crumble, we high fived. There was a lot of high fiving. Then came the nervous part. Who am I kidding, it was all nerve wracking! But royal icing is a bugger for sticking to surfaces, so feeling a little apprehensive I covered my whole beloved kitchen in icing power to roll out a sheet of icing big enough to cover the bottom tier. It took us two goes. But we totally did it. With only a minor rip. I think we handled that sheet of icing more carefully than a new born baby. Can we just take a moment to breathe? We're about 14 hours in so far, and my Spanish 'Paella Cow' apron (don't knock it until you've got one haters) was looking a little worse for wear. We make a cup of tea, pretty much down it, and back to work we go. Okay, so we've iced the bottom cake. 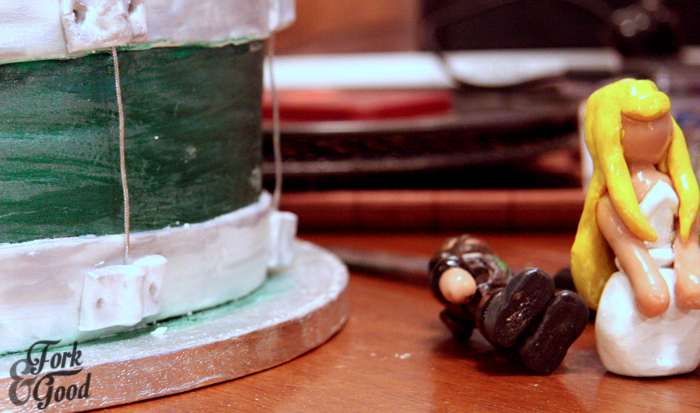 My icing smoother (a gift from god) is doing a pretty awesome job or filing out mishaps. We jump and high five, icing powder flies everywhere, and then we get back to work. Again. So then came the painting. I decided fairly early on I was going to be painting the cakes after a disastrous run at trying to colour royal icing (Green food colouring went in my eye). Plus with food paint I could make it shiny. Who doesn't love a shiny cake guys? Like seriously, tell me who doesn't? For the drums I bought Rainbow dusts' edible food paint in Holly green, and the silver paint for the rims and other little drum parts. I went ahead and bought the suggested easy sponge to apply it. Can't deny that the stuff worked a treat. Though it did take AGES to dry. It was still wet when I got it to the venue later that night. 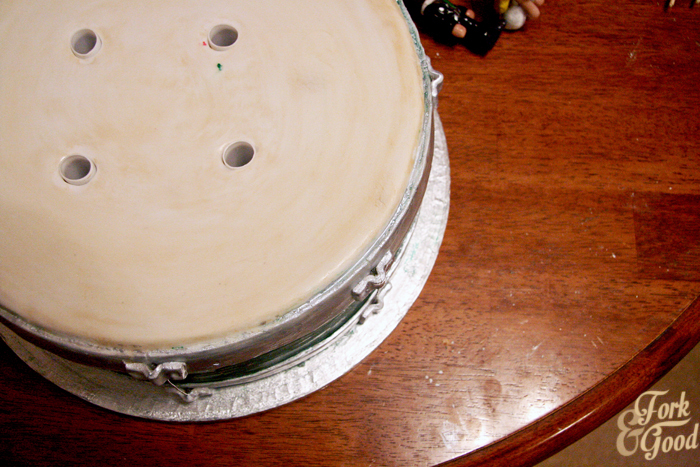 We also put in the cake dowels. Which was actually pretty easy thanks to a youtube video. WOO. So far, the paint not being dry was the only downside. 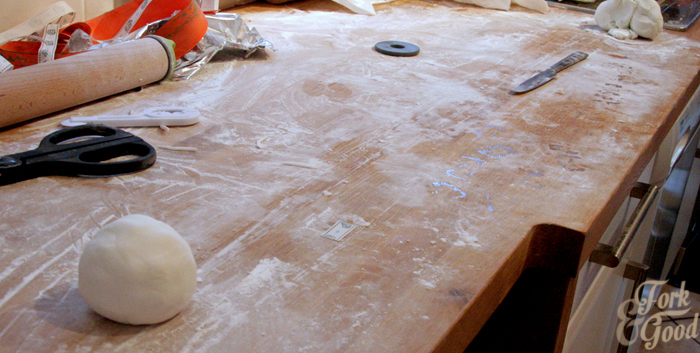 So no one really tells you how messy it can be making icing decorations for a cake. 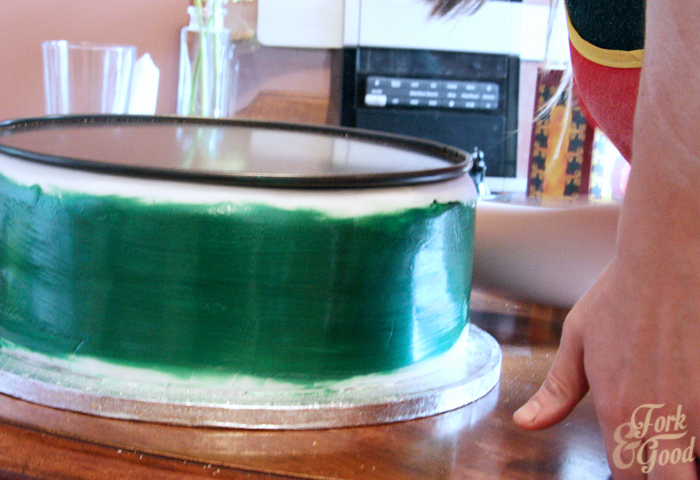 So then we started making a 12 inch long, 2mm thick ribbons of icing to replicate the drum rims. 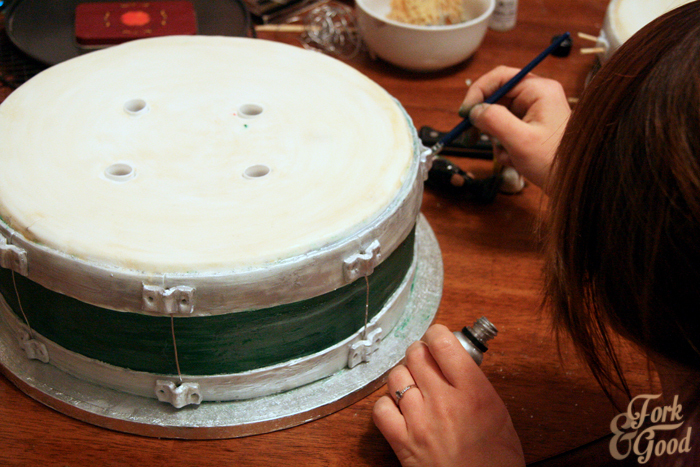 Getting it on the cake, evenly and straight - WITHOUT it ripping, was a nightmare. It took both of us to roll it out, cut it to size and apply it to the cake (with edible glue I might add... seriously what next?!) and even though we had to do a little bit of work to even it out, I was pretty impressed with our results. There's Georgie, measuring up the rims using a ribbon. That sounded quite rude when I read it back. So the next part, we didn't take many pictures of, because we were running out of time to get the cake ready for the venue. But over the next two hours, we made, painted an applied four drum rims, 34 little holdings and 14 bits of string to create the drums. We used a ribbon thickness as a template to measure out the thickness of the holdings, and to create the dent in the middle, I pushed a bamboo stick in and let it dry with it underneath. 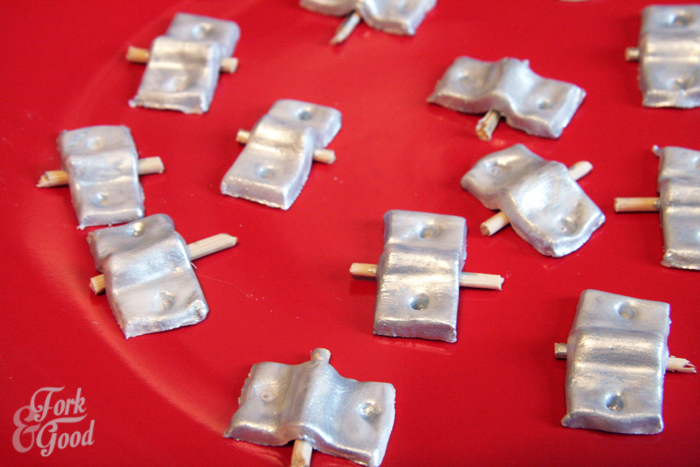 We applied with edible glue and held them in place with more bamboo sticks. The strings were put in place after, using a pointy end of a skewer dipped in edible glue to thread it into the holdings. It took ages, but I think the effect is pretty neat. I stained the tops (drum skins) with a mixture of coffee, cornflour and a little vodka. Luckily you couldn't taste it. Then came the toppers. By this time I'd waved goodbye to a fully knackered Georgie and embarked on this last part alone. 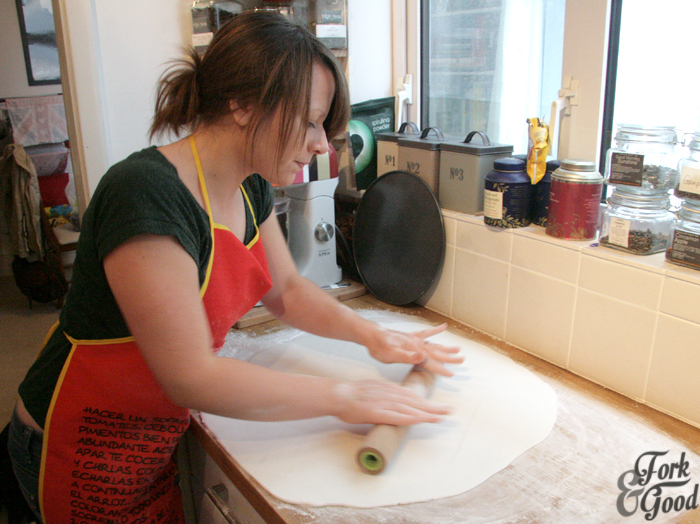 She'd pre-rolled me a small circle of royal icing which was setting in the kitchen. I painted it with a mixture of edbile glue and silver food paint before completely covering it with Edible glitter. The two toppers were glued into this at the venue with the help of bamboo sticks. These little beauties were made by my very talented little brother. This was a pretty accurate portrait of the evening do. So much drunk dancing. Brilliant. 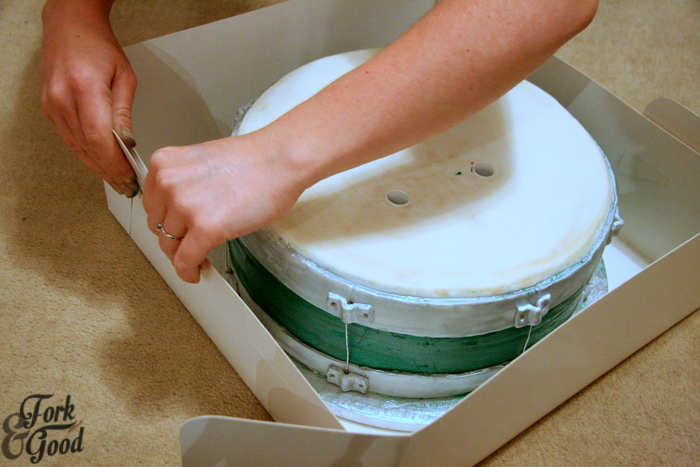 So after 20+ hours of cake making and decorating, it was time to transport it to the venue! I've never felt so sick in my life making that 20 minute car journey with wet, heavy cakes in flimsy boxes down bumpy country roads. It was nearly 9 'o clock, but it was done. Very nervously (can you tell I was nervous much? I only think I've used that word about 8 million times in this post) I stacked the cakes (there is a hidden cake board under the top cake) and even then I couldn't resist touching it up. I also added on the drum plaque with their names & the date. Propped on the toppers and then waited to everything to dry steady. So that's it. How me and my buddy made our first wedding cake for my Best Friends' Wedding. I'm not even ashamed to say that I took cake paint, bamboo sticks and edible glue in my handbag to the wedding in case it had damaged over night. 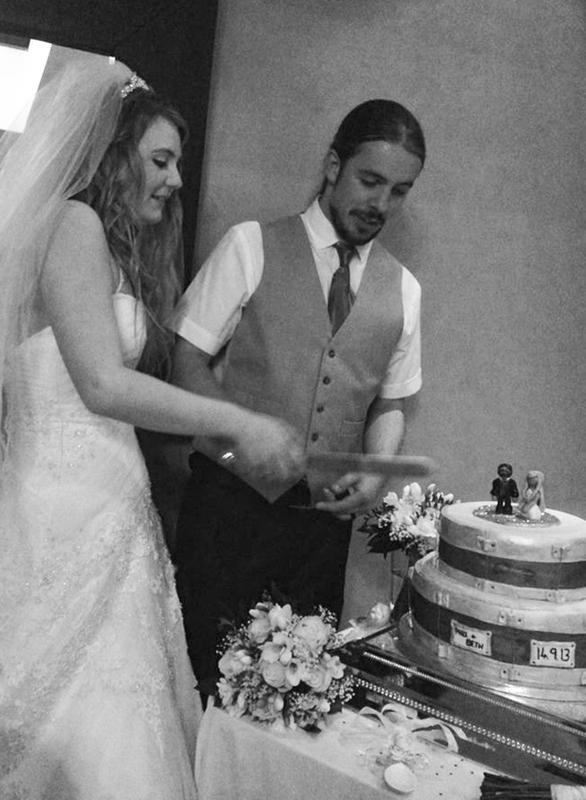 Anyway, here's a lovely picture I nicked of them cutting the cake the next evening. The wedding was wonderful, I cried in the ceremony (who knew I was a crier? I had no idea!) and I'm so happy for these guys. They are the best and I wish them every happiness. BIG MARRIED LOVE TO PHIL AND BETH! 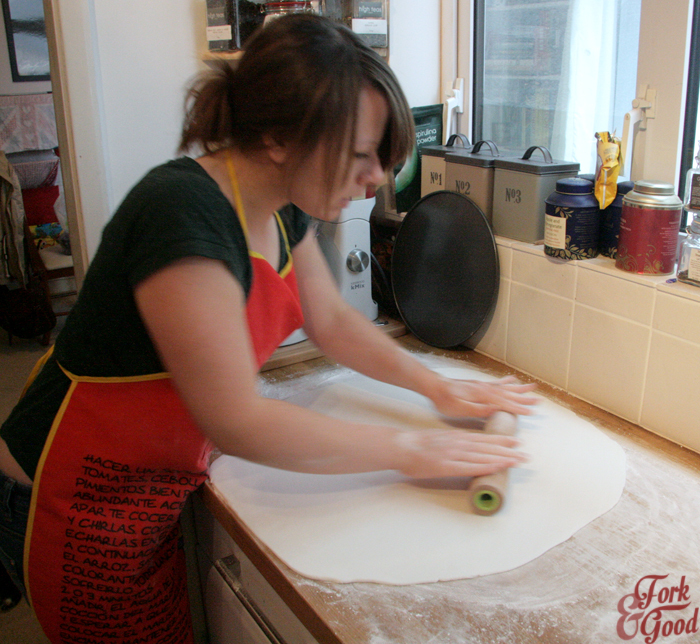 And a massive shout out To Georgie who kept me sane and did half the work over those two manic days of baking. I think I speak for both of us when I say we won't be touching royal icing for a good few weeks. I'm off for a nap! Bravo, Emma. 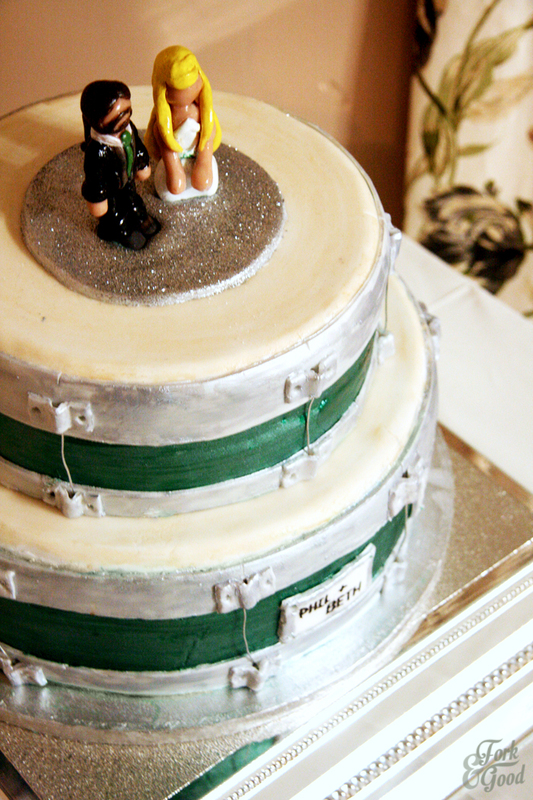 I would never have the guts to do a wedding cake project...you are really super in creating such a great wedding cake. Congratulations! That is one awesome cake!! I bet your friends were thrilled. I also made a massive wedding cake this weekend, so I know where you are coming from about the nerves :-) But you did a fab job! Thank you! Yours looks amazing too :) So much work goes into them, you don't even realise! Well done, Emma! Phil is so lucky to have you as a friend! A very good one! Omg that's amazing!! You did SUCH a good job, it looks brilliant! 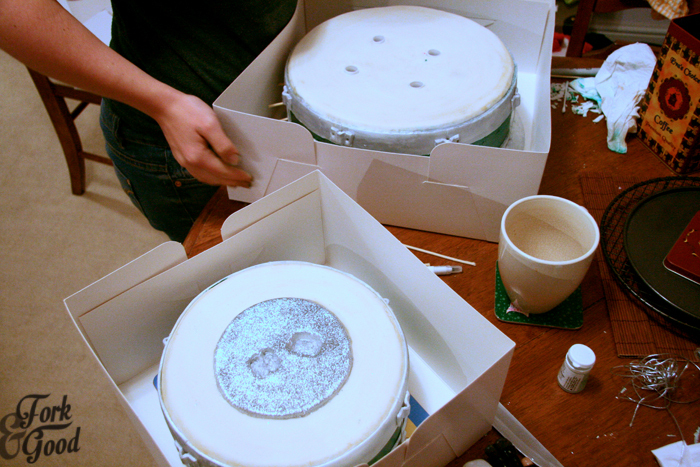 We've been thinking of doing a drum cake since my fiance is a drummer but I definitely couldn't do anywhere near as good a job as you did!! Ahh you should! Specially if you're marrying a drummer!! To be honest, i have no idea.... 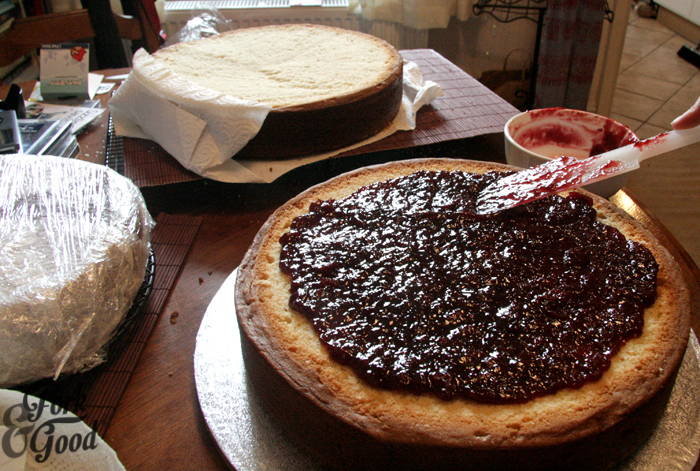 I used a bread knife that was smaller than the cakes. It should have gone horribly wrong! Ahh cheers! I needed a few days after to chill... and clean all the icing sugar off everything! Emma look absolutely amazing and i know is a lot of work, congrats!! The cake turned out beautiful. I would never be able to make a wedding cake, I would be too nervous. It's a bit frightening, but I bet you'd do a beautiful one! That wine is amazing, I recommend it to all! I've had so many emails asking me about it! Wow, what a stunning cake! Absolutely love the post too, it's so refreshing to read an honest account of making such an important cake!